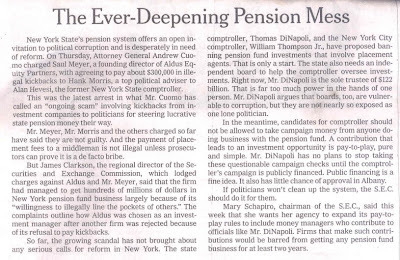 We commend to your attention today’s New York Times editorial: The Ever-Deepening Pension Mess. So far, the growing scandal has not brought about any serious calls for reform in New York. The state comptroller, Thomas DiNapoli, and the New York City comptroller, William Thompson Jr., have proposed banning pension fund investments that involve placement agents. That is only a start. The state also needs an independent board to help the comptroller oversee investments. Right now, Mr. DiNapoli is the sole trustee of $122 billion. That is far too much power in the hands of one person. Mr. DiNapoli argues that boards, too, are vulnerable to corruption, but they are not nearly so exposed as one lone politician. The temptation in the comptrollers’s scandal is that the structures allowed one man to control too much money and there was a lack of transparency to boot. It was just too easy to skim. That’s why reforms called for in the wake of the Hevesi scandal envision a board at the state level rather than having single individuals be responsible for investments. (By the way, we note that this important reform was not amongst the reforms proposed by the State Comptroller, the Governor and the State Superintendent of Insurance, in December 2007 per state press release proclaiming that the pension fund had been brought “up to modern standards”: GOVERNOR AND COMPTROLLER PROPOSE PENSION FUND REFORMS- Changes Will Create New Ethics Standards and Increase Transparency.) We suggest that as an indicator of earnestness, people watch to see which reformers call for pension investment decisions to be reposed in a newly formulated board and which reformers call for less than that. We appreciate the echo in pursuit of a good cause. Of course, establishment of a board is not a panacea. For instance, the City Comptroller’s Office does have boards in place. The protections of boards can be eviscerated* by structures where too much control is delegated allowing, all over again, too much power to be concentrated in individuals further down the line.